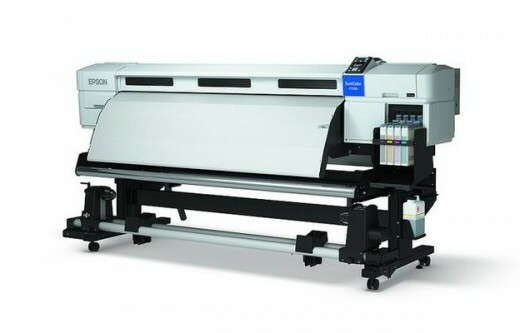 Epson announces new 64-inch dye sublimation printer SureColor SC-F7100. New printer Epson SureColor SC-F7100 is made on the basis of the success of the previous model SC-F7000 and Epson in a statement said that for its development took into account feedback from users about what they need when printing on textiles in small and medium-sized batches . Epson SureColor SC-F7100 is fully developed and manufactured by Epson and includes the automatic winding with improved tightening of materials, new post-Platten heater and optional drying system that guarantees improved reliability and efficiency of production of textile on rolls. Improved textile winding and tension of materials reduce the need for maintenance of the system and allow the Epson SureColor SC-F7100 to produce large series without constant supervision. Epson SureColor SC-F7100 is designed based on Epson’s production experience of hardware and Micro-Piezo printheads. DS UltraChrome ink, water-based is environmentally friendly and produces vivid colors with high quality accents and smooth transitions. The printer works with all widely accepted papers to transfer on the clothes, and with a wide range of substrate coated with polyester and other media including textiles, clothing, and even fiberglass, metal and plastic. Epson SureColor SC-F7100 will be available on the market since January of 2014.